Bend Tour Company electric bike tours-rentals provide the ultimate way for you to experience all that Bend has to offer! eBike Bend with us! CANCELLATIONS/REFUND POLICY: We offer a 100% refund on all booked tours if your reservation is canceled more than 24 hours before your scheduled tour. Any tour canceled by a guest less than 24 hours prior to the booked tour date/time may be charged a $50.00 fee. Cancellations are accepted in writing (email or post), via phone or in person. - Guests must be 16 years old or older to comply with Oregon electric bike laws. - Electric bike tours are appropriate and available for anyone 16 YEARS OLD OR OLDER who successfully completes Bend Tour Company's electric bike orientation. - Guests 16 to 18 years of age will need an adult (at least 25 years of age) to sign for them and glide with them on their tour. - Guests must be in reasonably good health and be able to safely handle an electric bike in a variety of conditions. 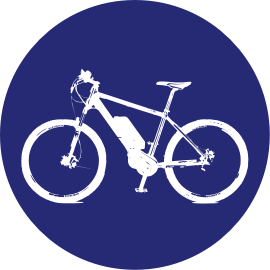 - Electric bikes are not recommended for guests with some mobility or motor control issues. If you are concerned about mobility issues please call us to discuss. We want every rider to have a safe tour.